Citation: Al-Nafea HM, Hamdy NM, Aref NMA. Lymphocyte subset and anti-HLA in AIDS Saudi patients. Res J Allergy Immunol. 2018;1(1):5-13. Human immunodeficiency virus (HIV) infection characterized by profound CD4+ T cell destruction compromised mucosal barrier function and chronic immune activation. In Kingdom of Saudi Arabia (KSA), acquired immune deficiency syndrome (AIDS) considers a significant public health problem. Our study design incorporated sixty-six AIDS Saudi patients under Highly Active Antiretroviral Therapy (HAART1) and after 6-12 months (HAART2), twenty healthy persons as a control. We measure subset lymphocyte cells by flow cytometry, CD3+4+ T cells, CD3+ 8+ T cells, and CD16+/CD56+ ratio were high significantly lower than controls in HARRT1 and HAART2 treatment (P ≤ 0.01). COBAS AmpliPrep assessed quantitation of HIV-1 RNA viral load in plasma, also Screening of Human leukocyte antigens antibodies (Panel reactive antibody (PRA)) measured by Luminex 100. There were no significant differences in class I, class II antibodies under the differences between groups, since the indication level value attained (0.311) Chi-square=4.780, and (0.104) Chi-square=4.531 respectively and these values were greater than (0.05) and inconsiderable. Contrary, the results of Class II showed considerable differences antibodies with variable gender. The level value attained (0.008), for study's Saudi women member. The more Immune-biomedical research will be needed in the future to decrease morbidity and mortality in HIV/AIDS patients. HIV infection featured by dysfunction of an immune system and a skewed T-cell homeostasis . An increase record of some HIV infections observed in KSA.2640 cases at the beginning of the year 2004 . Since years 2000 through 2009, a total of 10,217 new HIV cases were reported . HIV can invade the host cells in a various process which are eventually occurred by integrates its genetic material into host's genome . The predictors of HIV disease progression proven to be plasma viral load and absolute CD4+ T cell count. CD4+ T cell count used as an indicator for initiation of 59 antiretroviral therapy and preface or cessation of prophylaxis for opportunistic infections (OIs) [5,6]. It should be checked every 3–4 months. While the progression of the infection associated with a gradual loss of CD4+ T cells, the CD8+ T cell count is elevated at the very onset of contagion and during the chronic phase until the late phase where significant depletion of all Tcell subsets occurs . Advanced studies recommended additional parameters between CD8+ T cell and subsequent transient low- level viremia (TLLV) . CD8+ T-cell counts remain elevated in HIV infection even after long-term antiretroviral therapy (ART), which associated with an increased risk of not–AIDS-related events . Studies using allogeneic stimulus in therapeutic vaccination are supportive of the theory that controlling adverse immune responses may be as important as generating effective anti-HIV-1 immune responses and the responses to some of these vaccines includes the generation of anti-human leukocyte antigen (HLA) antibodies . Our study aims to evaluate the lymphocyte subset and HLA antibody in Saudi AIDS patients under HAART. There were ten males and ten females aged 20-50 years, healthy adult Saudi. The mean age of the control group was 25.6 years (range 20-39 years), all the control subjects were healthy people with no complaints of any disease. Also, all control who screened as HIV negative and hepatitis C virus (HCV) negative. Over a period of one year started from December 2014 sixty-six (13 females and 53 Males) AIDS patients mean age of patients were 37.34 years (median 37 and range 24.0-50.0), most (80%, n=53) patients were male in the HIV-1/AIDS treatment group. They were chosen from HIV clinic according to RT-PCR test in King Saud Medical City in Riyadh. All the AIDS patients diagnosed according to the “AIDS Diagnose and Treatment Guidelines.” Also, all patients were undertreated with HAART for six months and considered as a HAART; follow-up visits for another six months under medication as HAART2. Patients were scheduled to visit the clinic routinely. The examination of peripheral blood immunophenotyping and viral load took place every 6-12 months up to a year of the being. Panel Reactive Antibody (PRA) test is done for all patients. The blood samples were drawn from each control person and AIDS patients. The EDTA containers used according to the methods of each test. Separated plasma was immediately stored at-80°C until further analysis. Identification and determination the percentages and absolute counts performed of mature human lymphocyte subsets in erythrocyte-lysed whole blood ethylenediaminetetraacetate (EDTA) sample as following: T lymphocytes (CD3+ T cells), B lymphocytes (CD 19+ T cells), helper/inducer T lymphocytes (CD3+CD4+ T cells), suppressor/cytotoxic T lymphocytes (CD3+ CD8+ T cells) and Natural Killer (NK) lymphocytes (CD3+ CD16+ and /or CD 56+ T cells). The identification and determination will be performed by flow cytometer with a suitable immunofluorescence reagent kit. This kit is four-color direct immunofluorescence reagent for use with FacsCantoII flow cytometer to Identify and determines the percentages and absolute counts of mature human lymphocyte subsets in whole blood. BD Multitest IMK Kit 50 tests per kit- Catalog No.340503, and 50 tests per kit with BD Trucount tubes Catalog No.340504. HIV-1 RNA measures the viral load in plasma that quantitated by full automated PCR (COBAS). The COBAS AmpliPrep/ COBAS TaqMan HIV‐1 Test version 2.0, (P/N05212294190), COBAS AmpliPrep/COBAS TaqMan Wash Reagent (P/ N03587797190). Over a period of one year started from December 2014 sixtysix (13 females and 53 Males) AIDS patients mean age of patients were 37.34 years (median 37 and range 24.0-50.0), most (80%, n=53) patients were male in the HIV-1/AIDS treatment group. They were chosen from HIV clinic according to RT-PCR test in King Saud Medical City in Riyadh. All the AIDS patients diagnosed according to the “AIDS Diagnose and Treatment Guidelines.” Also, all patients were undertreated with HAART for six months and considered as a HAART; follow-up visits for another six months under medication as HAART2. Patients were scheduled to visit the clinic routinely. The examination of peripheral blood immunophenotyping and viral load took place every 6-12 months up to a year of the being. Panel Reactive Antibody (PRA) test is done for all patients. The blood samples were drawn from each control person and AIDS patients. The EDTA containers used according to the methods of each test. Separated plasma was immediately stored at -80°C until further analysis. Identification and determination the percentages and absolute counts performed of mature human lymphocyte subsets in erythrocyte-lysed whole blood ethylenediaminetetraacetate (EDTA) sample as following: T lymphocytes (CD3+ T cells), B lymphocytes (CD 19+ T cells), helper/inducer T lymphocytes (CD3+CD4+ T cells), suppressor/cytotoxic T lymphocytes (CD3+ CD8+ T cells) and Natural Killer (NK) lymphocytes (CD3+ CD16+ and /or CD 56+ T cells). The identification and determination will be performed by flow cytometer with a suitable immunofluorescence reagent kit. This kit is four-color direct immunofluorescence reagent for use with FacsCantoII flow cytometer to Identify and determines the percentages and absolute counts of mature human lymphocyte subsets in whole blood.BD Multitest IMK Kit 50 tests per kit- Catalog No.340503, and 50 tests per kit with BD Trucount tubes Catalog No.340504. Screening of PRA reading by Luminex 100, LABScreen Mixed Beads Mix (cat.≠ LSM 12 BD)-500 μl per vial. LABScreen Wash Buffer-10× (cat. ≠LSPWABUFY) 1 × 52 ml per bottle. LABScreen Mixed uses microbeads coated with purified Class I or Class II HLA antigens and pre-optimized reagents for the detection of Class I or Class II HLA antibodies in human sera. The earliest interactions of Luminex™ instruments distinguish up to 100 different colored beads in a single five reaction tube. By coupling specific HLA antigens (or a combination of antigens) onto specific colored beads, one can identify the specificities of anti-HLA antibodies present in patient serum. The beads washed to remove unbound antibody, and a secondary reporter antibody (usually anti-human IgG conjugated with phycoerythrin) added. The beads underwent further washing and analyzed in a Luminex™ instrument. It utilized the Lambda Array Beads Multi-Analyte system (LAMAS), which features the LABScan TM 100 flow analyzer for data acquisition and analysis. The instrument distinguishes one bead from another by the emission color of each bead after laser excitation. The signal emitted by the phycoerythrin conjugated secondary antibody, following excitation by a second laser used to measure the relative abundance of HLA antibodies bound to HLA molecules on the beads. It reported as mean fluorescence intensity (MFI). Together, the bead color and MFI used to identify the HLA antigen target(s) and to provide a semi-quantitative assessment of antibody strength . There was a statistically significant gender disparity between the two cohorts with a male preponderance in the treatment group (P=0.003). The lymphocyte subsets count illustrated in Table 1 lower count in HIV-1/AIDS patients (HAART1) compared to the uninfected controls except for T- Suppressor cells count and B-lymphocytes cell that elevated in patients. The number of CD3+4+ T cells, CD3+ 8+ T cells, and the CD4+/CD8+ ratio were significantly high lower than controls after HARRT1 treatment (P ≤ 0.01). Also, the double positives cell was lower than controls after HARRT1 treatment (P≤ 0.05). On another hand, the other lymphocyte subsets were still lower in AIDS patients but without statistical differences. Table 1: Comparison of lymphocyte subsets in peripheral blood of control and HAART 1. There are no considerable differences between control and HAART1 in both of (CD3+ T cells, CD16+ 56+cells, CD45+, CD19+ B cells), Since the indication level value of these variables successively attained (0.759, 0.985, 0.774, 0.634), all of the values are greater than (0.05) and inconsiderable. The number of B-lymphocytes cell was relatively higher in AIDS patients, but without statistical differences. The HAART2 group in Table 2, showed that lymphocyte subset was similar to HAART1 for CD3+8+T cells, CD3+4+ T cells count, and CD4+/CD8+ ratio. The exception was the NK cell count slightly increased in AIDS patients (mean=236.30) compared to control (224.03), but without statistical different. In contrast, the B- lymphocytes count was lower in AIDS patients than control, but without statistical differences. No significant differences between control and second groups HAART2 for CD3+ T cells, CD45+ cells, CD16+56+ cells, CD19+ B cells were detected. The indication level value for these variables was 0.332, 0.431, 0.682, and 0.534 respectively. When compared the lymphocytes subsets in HAART1 and HAART2 in Figure 1 we found no statistical differences between the two groups. Table 2: Comparison of lymphocyte subsets in peripheral blood of control and HAART 2. 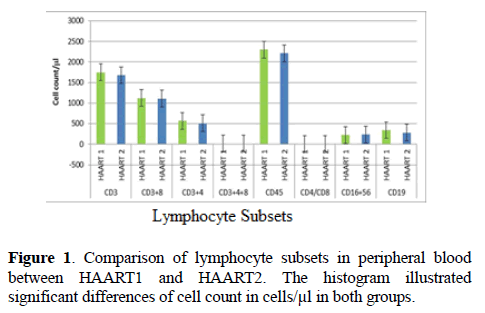 Figure 1: Comparison of lymphocyte subsets in peripheral blood between HAART1 and HAART2. The histogram illustrated significant differences of cell count in cells/μl in both groups. Table 3, was showing the median values of lymphocytes subsets with maximum and minimum ranges. The medians of CD4+ T cells cell count in control, HAART1, HAART2 were 953.12 cells/μl, 518.42 cells/μl and 465.71 cells/μl respectively. Also, the maximum value in HAART2 (1531.26 cells/lμ) was less than in HAART1 (2789.52 cells/μl); the T-helper cells count was high significantly lower in AIDS patients than control (P=0.001 for both groups). However, this calculation was steady during treatment (HAART1 and HAART2) which statistically not significant differences between AIDS patients. The Data of Real- time PCR illustrated in Table 4 no significant difference between HAART1 and HAART2 groups in viral load. No significant correlation between viral load (PCR) and CD 4+3+ T cells count, since the indication level value attained (0.186), this value is greater than (0.05) and not significant. Table 4: The comparison results of PCR (copies/μl) in HAART1 and HAART2 in AIDS patients. The Results of Kay-Graham test in Class I and Class II Antibodies under the differences of groups’ variable that illustrated in Table 5. Table 5: Anti-HLA class I and class II antibodies frequency and percentage in the studied groups. There were not significant differences in class I antibodies, under the differences between groups, since the indication level value attained (0.311), and this value is greater than (0.05) and inconsiderable (Chi-square=4.780). The results also were showed that there are no considerable differences in class II antibodies under the differences between groups since the indication level value attained (0.104), and this is value is greater than (0.05) and inconsiderable (Chi-square=4.531). The Results of Kay-Graham test in class 1 and Class II antibodies under the differences of variable gender in Tables 6 and 7, showed no considerable differences in class I antibodies under the differences of variable gender. Table 6: Frequency of PRA class I HLA antibodies in AIDS patients during ARV treatment according to gender. Table 7: Frequency of PRA class II HLA antibodies in AIDS patients during ARV treatment according to gender. Since the indication level value attained ( 0.250 ), this value is greater than ( 0.05 ) and inconsiderable (Chi-Square=2.772, P Value=0.250). Contrary, the results of Class II showed considerable differences antibodies with variable gender. The level value attained (0.008), for study's women member, since there were 113 include 104 AIDS for HAART 2 and HAART2 also nine control. Females are representing a percentage of 74.3% in all cohort groups which equal 81% of patients who possess any Class II antibodies. Since there were 31 of males representing the percentage 20.4%, having no Class II antibodies (Chi-Square=7.0339, P. Value=0.008) (Figures 2 and 3). 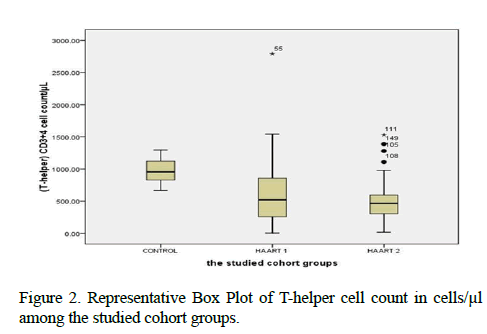 Figure 2: Representative Box Plot of T-helper cell count in cells/μl among the studied cohort groups. 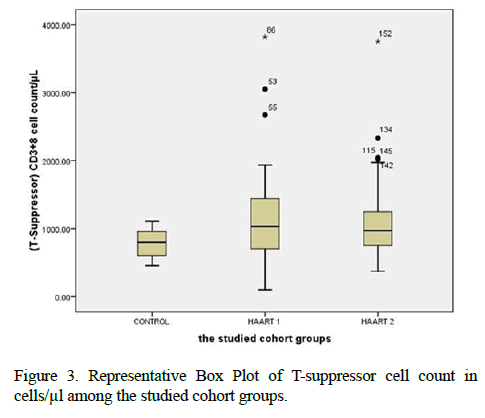 Figure 3: Representative Box Plot of T-suppressor cell count in cells/μl among the studied cohort groups. Even after a decade of effective treatment with a gradual recovery of CD4+ T cells in the majority of treated HIV-infected individuals achieved quantitative and functional defects in CD8 + T cells continue to exist [6,8,11,12]. In the present study in Tables 1 and 2 showed the same data concerning the count of CD4+ T cells. The mean was 567.22 cells/μl for control with high significantly lower than controls which were 960.41 cells/μl with HARRT1 and 511.17 cells/μl with HAART2 treatment (P ≤ 0.01) . The study supported our results for HAART treatment. They found that total CD4+ T cells significantly increased at 6 and 12 months after HAART treatment in AIDS patients. But still lower compared to control (CD4+ T cells in control 775 ± 150, in AIDS patients after HAART for six months CD4+ T cells was 289 ± 137, and after 12 months of HAART CD4+ T cells was 384 ± 384. The impairment in CD4+ T cell regeneration and the persistent elevation of CD8 + T-cell counts are considered a signal of the consequence of viral persistence and multiple inflammatory factors including gut microbial translocation, leading to major T cell dysfunction . Mechanisms underlying CD8+ persistence still unclear and may include immune activation due to residual viral replication . He et al. concluded that CD3+8+ T cells were 512 ± 195 in control but 783 ± 294 in HAART 6 months and 745 ± 232 on HAART for 12 months in AIDS patients. Comparing to our results in Tables 1 and 2, our values were 779 ± 210 in controls but was 1121 ± 632 in HAART1 while HAART2 was 1109 ± 559. It means that antiretroviral therapy had a significant clinical effect on virological suppression by CD3+8+ T cells in trigging the immune system and having a balance feedback with CD3+4+ T cells compared to the other studies . Proved highest drug distribution to the gut tissue and duodenal concentrations correlated well with T-cell markers in the duodenum, CD4+/CD8+ ratio, %CD4+ T cells and %CD8+HLA DR+CD38+ T cells. The efficacy of ART suppresses HIV replication in blood, On the other hand, HIVinfected individuals, experience persistent immunologic dysfunction, and inflammation that predict mortality and related to a chronically injured gut-associated lymphoid tissue. The CD4+/CD8+ ratio identified as a hallmark of immunosenescence and an independent predictor of all-cause mortality in the general population [15,16]. This fact prompted the evaluation of the CD4+/CD8 ratio as a surrogate marker. Our results did not have a significant value for the CD4+/ CD8+ ratio between HAART1 and HAART2. Which might be a benefit from screening programs or aggressive management of concomitant risk factors for aging-associated disease ? Hence, a persistently low level of CD4+/CD8+ ratio during otherwise effective ART associated with increased innate and adaptive immune activation . Although the mechanisms underlying partial correction of the CD4: CD8 ratio and persistently elevated CD8+ T cell count in long-term treated patients remain poorly understood. It has been recently indicated that patients with optimal CD4 T cell recovery and low CD4+: CD8+ ratio still harbor increased immune activation. An immune senescent phenotype had a higher risk of non-AIDS morbidity and mortality [6,8]. The median CD4+ T cell count and viral load set point women who treated for at least 12 months post-infection were 415 cells/and 39 783 copies/ml, respectively. These results reported by . The clinical evolution considered the time between the clinical diagnosis (symptoms appearance) and death. When viral plasma charge was under 10,000 viral copies/mL of plasma and CD4+ T cells were above 350 cells/mm3, antiretroviral treatment not recommended. Between 10,000 and 30,000 copies/mL and CD4+ LT between 200 and 350 cells/mm3, treatment depended on other factors. For viral charge above 30,000 copies/mL and CD4+ T cells lower than 200 cells/mm3, the patient must receive specific medication for HIV; Data were statistically evaluated using chi-square test (P<0.05) . Among the 238 patients with AIDS who received HAART, 47 patients developed IRIS. The percentages of CD4(+) and CD8(+) naive, memory, and activated cells exhibited no significant differences between AIDS patients with and without immune reconstitution inflammatory syndrome (IRIS) 24 weeks after initial HAART. The percentage of CD4 (+) CD25 (+) Foxp3 (+) regulatory T cells was lower in IRIS patients than in non-IRIS patients before HAART, 12 weeks after HAART, and 24 weeks after HAART . NK cells have a critical role in viral immunity. Also, the setting of HIV infection, epidemiologic and functional evidence support a role for NK cells in both protection from new infection and viral control. Specifically, NK cells directly mediate immune pressure leading to virus evolution. Moreover, NK cell receptor genotypic profiles, clonal repertoires, and functional capacity have all implicated in virus containment . The numbers of CD56+ NK cells reduced in HIV-infected patients as compared with control study participants  and this agrees with our result that showed a slight decrease in HAART1, and increased in HAART2, with no significant change in the two groups. Alloimmunizationprotects, the host from HIV-1 or the circumstances under which anti-HLA antibodies are protective. However, a possible mechanism in which anti- HLA antibodies may protect the host, even in the absence of viral neutralization, is by binding to the HLA homologous regions of the HIV-1 envelope protein gp120. HIV-1gp120 can mimic self HLA and activate alloimmune responses. By binding peptide epitopes in the carboxyl terminus, C5domain gp120 can activate antigen-specific T cell responses using in vitro cell culture models [24,25]. In addition to the possibility of causing direct allorecognition, regions within gp120 contain epitopes similar to those of self HLA . The C5 domain of gp120 may be particularly important. This region partially mimics the 3rd hypervariable region of the HLA-DR chain. Polymorphism in the -helical region of the HLA-DR chain defined by the HVR3 shown to be a key region in determining both HLA class II specific alloreactivity via direct allorecognition as well as being recognized via the indirect pathway of allorecognition . We found the percentage of HLA class I antibodies had (10%) for control compare to (10.6% to19.7%) in the treated AIDS patients from 6 to 12 months. On the other hand, for HLA class II antibodies exhibited (15%) for control compare to (3.0% to 4.5%) in the treated AIDS patients from 6 to 12. Although no evidence obtained for a protective role of anti-HLA antibodies against HIV-1, one or more of these responses might be contributing to the proof of alloimmune response- Mediated protection against HIV-1 . However, an equal distribution of these alloantibodies was found among the individuals infected, independent on the clinical evolution. Thus, class I anti-HLA alloantibodies was not a determinant factor for patient worsening . It was recognized considerable differences in Class II antibodies under the differences of gender at a level value (0.008) since there are 113 females (104 AIDS patients include HAART1and HAART2, and nine control) representing a percentage of 74.3% of all cohort studies groups and 81% of females AIDS patients. Who possess any of Class II antibodies. The C5 peptide is predicted to bind to some HLA including HLA-B35, B27, and B8. As a significant proportion of the endogenous self-peptides repertoire presented to T cells derived from HLA molecules, these peptides and the correspondinggp120 homologous peptides make likely candidates for all epitopes . In our study, it was evident for individual women to be protected more than individual men during disease progression. It could be exploited by gp120 to break tolerance to self-HLA correctly. However, anti-HLA antibodies have also been associated with an LTNP phenotype despite a lack of neutralizing activity while other studies have shown no correlation between the presence of anti-HLA antibody and disease progression . Biomarkers of inflammation and immune activation moved toward HIV-negative levels within the first year after HAART-induced HIV suppression. The PRA score represents the proportion of the population to which the person being tested will react via pre-existing antibodies. These antibodies target the HLA, a protein found on most cells of the body. Each population will have a different demographic of HLA antigens, and so the PRA test will differ from country to country Although several markers of T cell activation returned to levels present in HIV- Negative men. Residual immune activation, particularly monocyte/macrophage activation, was present. This residual immune activation may represent a therapeutic target to improve the prognosis of HIV-infected individuals receiving HAART . The more Immune-biomedical research will be needed in the future to indicate the actual high level of Class I and Class II PRA, which may protect the host during ARV therapy. The generation of anti-HLA antibodies and their ability to crossreact with gp120 may depend on upon the HLA typing of the individual, and more research for CD8 to evaluate its role in AIDS progression. Acknowledge to the Research Committee, Epidemiology Unit, HIV clinic, and Region Lab at King Saud Medical City in Riyadh. Many thanks to the staff at the administration of the Region Lab and Immunology Department for their professional manner and samples collection. Our appreciation goes to Dr. Rabih Halwani in immunology research lab and his staff members at King Khalid Hospital, College of Medicine, KSU, in Riyadh. Finally, Special acknowledgment to Research Center of Female Scientific and Medical Colleges, Deanship of Scientific Research, KSU due to their grant support for our project. Cao W, Mehraj V, Kaufmann DE, Li T, Routy JP. Elevation and persistence of CD8 T-cells in HIV infection: the Achilles heel in the ART era. J Int AIDS Soc 2016; 19. Al-Mazrou YY, Al-Jeffri MH, Fidail AI, Al-Huzaim N, El-Gizouli SE. HIV/AIDS epidemic features and trends in Saudi Arabia. Ann Saudi Med 2005; 25: 100-104. Kabbash IA, Felemban SM, Stephens GM, Al-Hakeem RF, Zumla AI, Memish ZA. HIV case notification rates in the Kingdom of Saudi Arabia over the past decade (2000–2009) 2012; 7. Marx J, Hockberger R, Walls R. HIV Infection, and AIDS. In: Rosen's emergency medicine- concepts and clinical practice. (8th edtn). Elsevier Health Sciences 2013 PP: 1751-1767. Soha H. Panel on Antiretroviral Guidelines for Adults and Adolescents: Guidelines for the use of antiretroviral agents in HIV-1-infected adults and adolescents 2008. Lu W, Mehraj V, Vyboh K, Cao W, Li T, Routy JP. CD4: CD8 ratio as a frontier marker for clinical outcome, immune dysfunction, and viral reservoir size in virologically suppressed HIV-positive patients. J Int AIDS Soc 2015; 18: 350. Taiwo B, Hunt PW, Gandhi RT, Ellingson A, McKenna M, Jacobson JM, Gripshover B, Bosch R J. CD8+ T-cell activation in HIV-1-infected patients experiencing transient low-level viremia during antiretroviral therapy. J Acquir Immune Defic Syndr 2013; 63: 101. Cao W, Mehraj V, Trottier B, Baril JG, Leblanc R, Lebouche B, Cox J, Tremblay C, Lu W, Singer J, Li T, Routy JP. Early initiation rather than prolonged duration of antiretroviral therapy in HIV infection contributes to the normalization of CD8+ T-cell counts. Clin Infect Dis 2015; 62: 250-257. MacDonald K, Fowke K, Kimani J, Dunand V, Nagelkerke N, Ball T. The influence of human leukocyte antigen supertypes on susceptibility and resistance to HIV-1 infection. J Infect Dis 2000; 181: 1581-1589. Peña JRA, Saidman SL. Anti‐HLA antibody testing in hematology patients. Am J Hematol 2015; 90: 361-364. Johnson LF, Mossong J, Dorrington RE, Schomaker M, Hoffmann CJ, Keiser O, Fox MP, Wood R, Prozesky H, Giddy J, Garone DB, Cornell M, Egger M, Boulle A. Life expectancies of South African adults are starting antiretroviral treatment: Collaborative analysis of cohort studies. PLoS Med 2013; 10. Nakagawa F, May M, Phillips A. Life expectancy living with HIV: recent estimates and future implications. Curr Opin Infect Dis 2013; 26: 17-25. He Y, Li J, Zheng Y, Luo Y, Zhou H, Yao Y, Chen X, Chen Z, He M. A randomized case–Control study of dynamic changes in peripheral blood Th17/Treg cell balance and interleukin-17 levels in highly active antiretroviral-treated HIV type 1/AIDS patients. AIDS Res Hum Retroviruses 2012; 28: 339-345. Serrano-Villar S, Sainz T, Ma ZM, Utay NS, Chun TW, Mann S, Kashuba AD, Siewe B, Albanese A, Troia-Cancio P, Sinclair E, Somasunderam A, Yotter T, Deeks SG, Landay A, Pollard RB, Miller CJ, Moreno S, Asmuth DM. Effects of Combined CCR5/Integrase Inhibitors-Based Regimen on MucosalImmunity in HIV-Infected Patients Naive to Antiretroviral Therapy: A Pilot Randomized Trial. PLoS pathogens 2016; 12. Ndhlovu LC, Chapman JM, Jha AR, Snyder-Cappione JE, Pagán M, Leal FE, Boland BS, Norris PJ, Rosenberg MG, Nixon DF. Suppression of HIV-1 plasma, viral load below detection, preserves IL-17 producing T cells in HIV-1 infection. AIDS 2008; 22: 990. Sabat R, Witte E, Witte K, Wolk K. IL-22 and IL-17: an overview. IL-17, IL-22, and Their Producing Cells: Role in Inflammation and Autoimmunity: Springer 2013 PP: 11-35. Alexander M. CD4: CD8 ratio and non-AIDS defining events in viral sup- pressed HIV-infected patients: need to look beyond CD4+ T cell counts. HIV/AIDSRes Treat Open J 2015; 2. Serrano-Villar S, Sainz T, Lee SA, Hunt PW, Sinclair E, Shacklett BL, Ferre AL, Hayes TL, Somsouk M, Hsue PY, Van Natta ML, Meinert CL, Lederman MM, Hatano H, Jain V, Huang Y, Hecht FM, Martin JN, McCune JM, Moreno S, Deeks SG. HIV-infected individuals with low CD4/CD8 ratio despite effective antiretroviral therapy exhibit altered T cell subsets, heightened CD8+ T cell activation, and increased risk of non-AIDS morbidity and mortality. PLoS Pathog 2014; 10. Roberts L, Passmore JA, Williamson C, Little F, Bebell LM, Mlisana K, Burgers WA, van Loggerenberg F, Walzl G, Djoba Siawaya JF, Karim QA, Karim SS. Plasma cytokine levels during acute HIV-1 infection predict HIV disease progression. AIDS 2010; 24: 819-831. Leite ERM, Lima OLL, Leite FRM, Costa PId. Frequency of class I anti-HLA alloantibodies in patients infected by HIV-1. Brazilian Arch Bio Tech 2010; 53: 93-97. Scully E, Alter G. NK Cells in HIV Disease. Current HIV/AIDS Reports 2016; 13: 85-94. Bächle SM, Malone DF, Buggert M, Karlsson AC, Isberg PE, Biague AJ, Norrgren H, Medstrand P, Moll M, Sandberg JK, Jansson M. Elevated levels of invariant natural killer T-cell and natural killer cell activation correlate with disease progression in HIV-1 and HIV-2 infections. AIDS (London, England). 2016; 30: 1713-1722. Sheikh MJ, Ongrádi J, Austen BM, Dalgleish AG. The gp120 envelope HIV-1 binds peptides in a similar manner to human leukocyte antigens. AIDS1995; 9: 1229-1236. Cadogan M, Austen B, Heeney JL, Dalgleish AG. HLA homology within the C5 domain promotes peptide binding by HIV type 1 gp120. AIDS Res Hum Retroviruses 2008; 24: 845-855. Cadogan M, Dalgleish AG. HIV induced AIDS and related cancers: chronic immune activation and future therapeutic strategies. Adv Cancer Res 2008; 101: 349-395. Smith PL, Dalgleish A. Subtle Mimicry of HLA by HIV-1 GP120–A Role for Anti-HLA Antibodies? Open Autoimmun J. 2010; 2:104-116. Lakhashe SK, Thakar MR, Bharucha KE, Paranjape RS. Quantitation of HLA proteins incorporated by human immunodeficiency virus types 1 and assessment of the neutralizing activity of anti-HLA antibodies. J. Virol 2008; 82: 428-434. Luscher MA, Choy G, Njagi E, Bwayo JJ, Anzala AO, Ndinya-Achola JO, Ball TB, Wade JA, Plummer FA, Barber BH, MacDonald KS. Naturally occurring IgG anti-HLA alloantibody does not correlate with HIV type 1 resistance in Nairobi prostitutes. AIDS research and human retroviruses. 1998; 14: 109-115. Wada NI, Jacobson LP, Margolick JB, Breen EC, Macatangay B, Penugonda S. The effect of HAART-induced HIV suppression on circulating markers of Inflammation and immune activation. AIDS 2015; 29: 463-471.